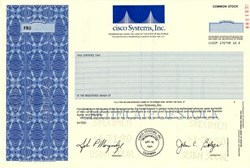 Beautiful engraved specimen certificate from the Cisco Systems, Inc dated Janusry 31, 1990. This historic document was printed by United States Bank Note Company and has an ornate border around it with a vignette of the company logo. This item has the printed signatures of the Company's President, John Morgridge and Secretary, John C. Bolger and is over 30 years old. John Morgridge was the 34th employee at Cisco Systems when he joined as President and CEO in 1988. Morgridge joined the company despite its notoriously toxic culture and revenue of only $5 million annually. By the time Morgridge concluded his tenure as CEO in 1995, he had grown sales to over $1 billion and 2,250 employees worldwide. 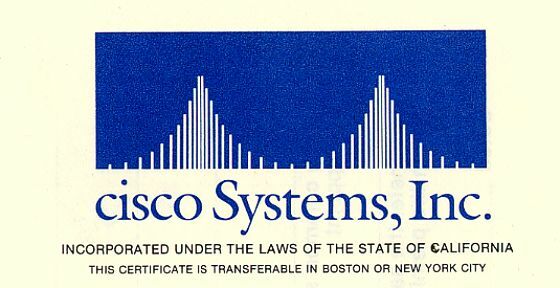 Cisco Systems, Inc. (NASDAQ: CSCO) is an American multinational corporation headquartered in San Jose, California, United States, that designs, manufactures, and sells networking equipment. Cisco has more than 60,000 employees and annual revenue of US$ 11.5 billion as of 2012. The stock was added to the Dow Jones Industrial Average on June 8, 2009, and is also included in the S&P 500 Index, the Russell 1000 Index, NASDAQ 100 Index and the Russell 1000 Growth Stock Index. While Cisco was not the first company to develop and sell a router, it was one of the first to sell commercially successful routers supporting multiple network protocols. As the Internet Protocol (IP) has become a standard, the importance of multi-protocol routing as a function has declined. Today, Cisco's largest routers are marketed to route primarily IP packets and MPLS frames. In 1990, the company went public and was listed on the Nasdaq stock exchange. Lerner was fired and because of that, Bosack quit but not before receiving $200 million. Most of those profits were given to charities and the two later divorced. Cisco acquired a variety of companies to bring in talent and innovation into the company. Several acquisitions, e.g. Stratacom, were the biggest deals at the time when it happened. During the Internet boom in 1999, the company acquired Cerent Corp., a start-up company located in Petaluma, California, for about US$7 billion. It was the most expensive acquisition made by Cisco at that time. Since then, only Cisco's acquisition of Scientific-Atlanta has been bigger. Although not every acquisition is equally successful, Cisco has been on the successful side integrating its acquisitions compared to its competitors. Several acquired companies has grown into the backbone business units for Cisco in the LAN switching, VOIP, and home networking area. In late March 2000, at the height of the dot-com boom, Cisco was the most valuable company in the world, with a market capitalization of more than US$500 billion. In 2007, with a market cap of about US$180 billion, it is still one of the most valuable companies. CSCO was voted stock of the decade on NASDAQ. The company's 7500 Series router was voted 3rd in the product of the decade 1990-2000 behind the Mosaic web browser and the Novell LAN manager. Cisco has made inroads into many network equipment markets outside routing, including Ethernet switching, remote access, branch office routers, ATM networking, security, IP telephony, and others. In 2003, Cisco acquired Linksys, a popular manufacturer of computer networking hardware and positioned it as a leading brand for the home and end user networking market (SOHO). The company's first two CEOs are John Morgridge and John Chambers.